RS Aggarwal (2015) Solutions for Class 10 Math Chapter 20 Summative Assessment I are provided here with simple step-by-step explanations. These solutions for Summative Assessment I are extremely popular among class 10 students for Math Summative Assessment I Solutions come handy for quickly completing your homework and preparing for exams. All questions and answers from the RS Aggarwal (2015) Book of class 10 Math Chapter 20 are provided here for you for free. You will also love the ad-free experience on Meritnation’s RS Aggarwal (2015) Solutions. All RS Aggarwal (2015) Solutions for class 10 Math are prepared by experts and are 100% accurate. On dividing a by b, let q be the quotient and r be the remainder. Here, the number of zeros is two, as the graph intersects the x - axis at two points. In ΔABC, DE ∥ BC. If AD = 3 cm, DB = 2 cm and DE = 6 cm, then BC = ? If sin 3θ and (θ − 2°), where 3θ and (θ − 2°) are both acute angles, then θ = ? 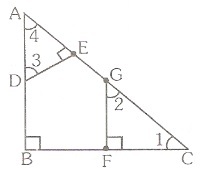 By Pythagoras' theorem, we get AB = 1. After how many places of decimal, will the decimal expansion of 4940 terminate ? So, it will terminate after 3 decimal places. Hence, the given system of equations has no solution. We know that the abscissa of the point of intersection of the two ogives gives the median. Hence, the required median is 18.5. Is (7 × 5 × 3 × 2 + 3) a composite number? Justify your answer. Hence, (7 × 5 × 3 × 2 + 3) is a composite number. When a polynomial p(x) is divided by (2x + 1), is it possible to have (x − 1) as a remainder? Justify your answer. When we divide a polynomial by another polynomial of degree, say 'm', then the remainder left is always of a degree less than m, i.e. the remainder can be at most of degree '(m – 1)'. Here, if we divide p(x) by (2x + 1), i.e. we divide p(x) by a polynomial of degree 1, then the remainder can be of degree '0', i.e. a constant polynomial. Since degree of (x – 1) is 1, which is greater than '0', it is not possible to have (x – 1) as a remainder when p(x) is divided by (2x + 1). If 3 cos2θ + 7 sin2θ = 4, show that cot θ = 3. Or, if tan θ=815, evaluate(2+2sinθ)(1-sinθ)(1+cosθ)(2-2cosθ). In the given figure, DE ∥ AC and DF ∥ AE. In the given figure, AD ⊥ BC and BD=13CD. Given: In ΔABC, AD⊥BC and BD=13CD. As the class 30 - 40 has maximum frequency, it is the modal class. Show that any positive odd integer is of the form (4q + 1) or (4q + 3), where q is a positive integer. Let a be any odd positive integer. we have to prove that a is of the form 4q + 1 or 4q + 3, where q is some integer. Since a is an integer, consider b = 4 as another integer. a = 4q + r for some integer q ≥ 0 and r = 0, 1, 2 and 3, since 0 ≤ r < 4. Therefore, a = 4q or 4q + 1 or 4q + 2 or 4q + 3. However, since a is odd, it cannot take the values 4q or 4q + 2 (since all these are divisible by 2). Hence, any odd integer can be expressed in the form 4q + 1 or 4q + 3, where q is some integer. Prove that (5-3) is irrational. Or, prove that 335 is irrational. Since, p and q are integers, 5-pq is rational; so, 3 is rational. But this contradicts the fact that 3 is irrational. So, we can conclude that 5-3 is irrational. Since, p and q are integers, 5p3q is rational; so, 3 is rational. So, we can conclude that335 is irrational. A man can row a boat at the rate of 4 km/hour in still water. He takes thrice as much time in going 30 km upstream as in going 30 km downstream. Find the speed of the stream. Or, in a competitive examination, 5 marks are awarded for each correct answer, while 2 marks are deduced for each wrong answer. Jayant answered 120 questions and got 348 marks. How many questions did he answer correctly? The speed of the boat in still water is 4 km/hr. Hence, the speed of the stream is 2 km/hr. Hence, Jayant answered 84 questions correctly. If α and β are the zeros of the polynomial 2x2+x-6, then form a quadratic equation whose zeros are 2α and 2β. f(x) = 2x2 + x - 6 is the given polynomial. It is given that,α and β are the zeros of the polynomial. Let 2α and 2β be the zeros of the polynomial g(x). Prove that (cosec θ − sin θ)(sec θ − cos θ) = 1tanθ+cotθ. If cos θ + sin θ = 2cosθ, prove that cos θ − sin θ = 2sinθ. ΔABC and ΔDBC are on the same base BC and on opposite sides of BC. If O is the point of intersection of BC and AD, prove that ar(∆ABC)ar(∆DBC)=AODO. Given: ΔABC and ΔDBC are on the same base BC and AD intersects BC at O. Construction : Draw AL⊥BC and DM⊥BC. In ΔABC, AD is a median and E is the mid-point of AD. If BE is produced to meet AC at F, show that AF=13AC. Given: In Δ ABC, AD is a median and E is the mid-point of AD. Also, BE is produced to meet AC at F.
Construction: From D, draw DG∥EF, meeting AC at G.
In ΔBCF, D is the mid-point of BC and DG∥BF. ∴ G is the mid point of CF. In ΔADG, E is the mid-point of AD and EF∥DG. ∴ F is the mid-point of AG. 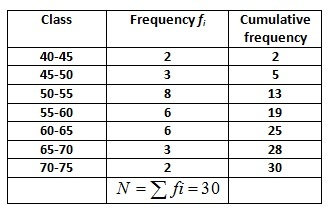 Or, The mean of the following frequency distribution is 24. Find the value of P.
For calculating the mean, we prepare the table as shown below. Hence, the mean of the given frequency is 148.61. Hence, the value of p is 20. 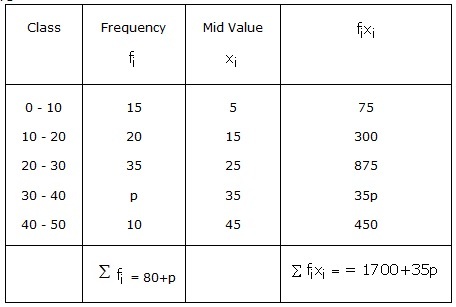 The cumulative frequency table for the given data is shown below. Cumulative frequency just greater than 26.5 is 29. The corresponding class interval is 60 - 70. Thus, median class is 60 - 70.
p(x)=2x4 − 3x3 − 5x2 + 9x − 3 and two of its zeros are 3 and -3. Find the other two zeros. The given polynomial is f(x) = 2x4 - 3x3 - 5x2 + 9x - 3. Since, 3and-3 are are two zeros of f(x), it follows that each one of x-3 and x+3 is a factor of f(x). Consequently, x-3x+3=x2-3 is a factor of f(x). Hence, the other two zeros are 12and 1. Or, prove that in a triangle, if the square of one side is equal to the sum of the squares of the other two sides, the angle opposite the first side is a right angle. Proof: Since Δ ABC ∼ Δ DEF, it follows that they are equiangular and their sides are proportional. Construction: Draw Δ DEF, such that DE = AB, EF = BC and ∠E = 90°. If sec θ + tan θ = x, prove that sin θ = x2-1x2+1. Shade the region bounded by these lines and the y-axis. On a graph paper, draw a horizontal line X'OX and a vertical line YOY' as the x-axis and y - axis respectively. Putting x = 1, we get y = 1. Putting x = 2, we get y = 3. Putting x = 0, we get y = −1. Now, plots the points A(1, 1) , B( 2, 3) and C(0, −1) on the graph paper. Join AB and AC to get the graph line BC. Extend it both ways. Thus, line BC is the graph of 2x − y = 1. Putting x = 1, we get y = 2. Putting x = 0, we get y = 1. Now, plot the points P(1, 2), Q(0, 1). The point B(2, 3) has already been plotted. Join PB and PQ to get the graph line BQ. Extend it both ways. Then, the line BQ is the graph of the equation x − y = 1. The two graph lines intersect at B(2, 3). ∴ x = 2 and y = 3 is the solution of the given system of equations. These graph lines intersect the y-axis at C and Q. Hence, the region bounded by these lines and the y - axis has been shaded. Change the above distribution to 'more than type' distribution and draw its ogive. We may prepare the more the series as shown below. ∴ x = 1 and y = - 1 is the required solution. 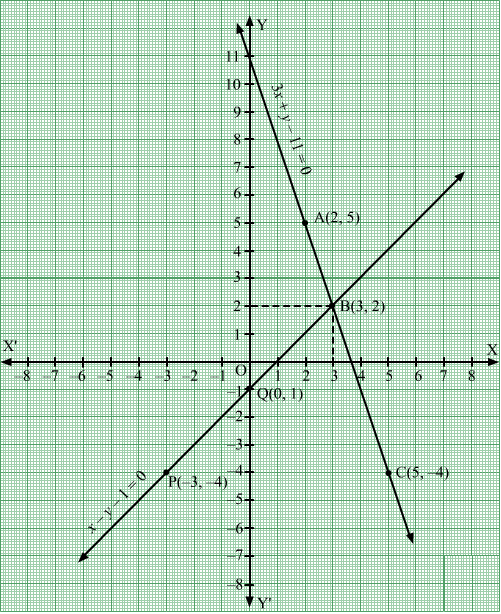 ΔABC is right-angled at B and D is the mid-point of BC. Given: In Δ ABC, ∠B = 90° and D is the mid-point of BC. Cumulative frequency just greater than 50 is 63. Corresponding class interval is 30 - 40. Thus, median class is 30 - 40. Cumulative frequency just before this class = 33. Clearly the required number divides (245 - 5), i.e. 240 and (1029 - 5), i.e. 1024 exactly. So, the required number is H.C.F. (240, 1024). Hence, 16 is the largest number that divides 245 and 1029 and leaves remainder 5 in each case. If the product of zeros of the polynomial ax2−6x−6 is 4, then a = ? Let α and β be the zeros of ax2 - 6x - 6. 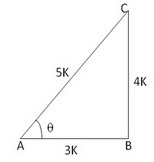 The areas of two similar triangles ΔABC and ΔPQR are 25 cm2 and 49 cm2, respectively, and QR = 9.8 cm. Find BC. It is given that △ABC~△PQR. Also, QR = 9.8 cm. We have to find BC. We know that the ratio of the areas of two similar triangles is equal to the ratio of the squares of their corresponding sides. Hence, BC = 7 cm. If sin (θ + 34°) = cos θ and θ + 34° is acute, find θ. If cos θ = 0.6, find 5 sin θ − 3 tan θ. 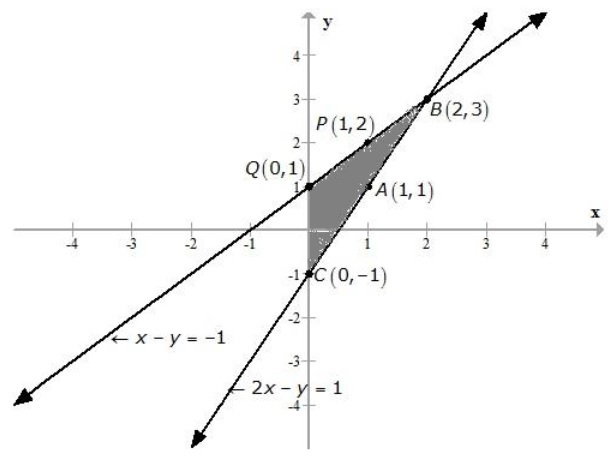 ∴ These graph lines will intersect at a unique point, when a1a2≠b1b2. Hence, the given system has a unique solution. Hence, by the above formula, x = 3 and y = 2. Check whether 6n can end with the digit 0? Justify your answer. If any number ends with the digit 0, it should be divisible by 10. In other words, its prime factorisation must include primes 2 and 5. By the Fundamental Theorem of Arithmetic, prime factorisation of a number is unique. 5 is not a prime factor of 6n. Hence, 6n cannot end with the digit 0 for any natural number n.
Find the zeros of the polynomial 9x2 − 5 and verify the relation between zeros and coefficients. So, the zeros of f(x) are -53and53. If 2 sin 2θ = 3, find the value of θ. Or, If 7 sin2θ + 3 cos2θ = 4, show that tan θ = 13. In ΔABC, D and E are points on AB and AC, respectively, such that AD = 5 cm, DB = 8 cm and DE ∥ BC. If AC = 6.5 cm, find AE. Let AE be x cm. Hence, AE = 2.5 cm. D is a point on the side BC of ΔABC, such that ∠ADC and ∠BAC are equal. Prove that: CA2 = DC × CB. Given: In ΔABC, D is a point on BC, such that ∠ADC = ∠BAC. To prove: CA2 = DC × CB. So, the sides of ΔABC and ΔDAC are proportional. 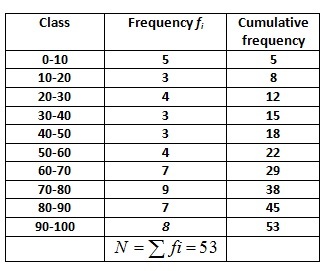 As the class 4 - 8 has maximum frequency, it is the modal class. Show that any positive odd integer is of the form (6q + 1) or (6q + 3) or (6q + 5), where q is some integer. Let a be any odd positive integer. We have to prove that a is of the form 6q + 1 or 6q + 3 or 6q + 5, where q is some integer. Since a is an integer, consider b = 6 as another integer. a = 6q + r for some integer q ≥ 0 and r = 0, 1, 2, 3, 4, 5 since 0 ≤ r < 6. Also, 6q + 1 = 2 × 3q + 1 = 2k1 + 1, where k1 is a positive integer. Hence, any odd integer can be expressed in the form 6q + 1, or 6q + 3, or 6q + 5, where q is some integer. Prove that (3-5) is irrational. Or, prove that 223 is irrational. Let us assume that 3-5 is rational. Since, p and q are integers, we get 3-pq is rational; so, 5 is rational. But this contradicts the fact that 5 is irrational. So, we conclude that3-5 is irrational. Since, p and q are integers, 3p2q is rational; so 2 is rational. But this contradicts the fact that 2 is irrational. So, we conclude that223 is irrational. What number must be added to each of 5, 9, 17, 27 so that the new numbers are in proportion? Or, the sum of two numbers is 18 and the sum of their reciprocals is 14. Find the numbers. Let the required number be x. Hence, the required number is 3. Let the required numbers be x and y. On solving (i) and (ii), we get: x = 12 and y = 6. On solving (iii) and (iv), we get: x = 6 and y = 12. Hence, the required numbers are 12 and 6. If α, β are the zeros of the polynomial (x2 − x − 12), then form a quadratic equation whose zeros are 2α and 2β. f(x) = x2 - x - 12 is the given polynomial. Hence, the required polynomial is g(x) = x2 - 2x - 48. Prove that (sin θ + cosec θ)2 + (cos θ + sec θ)2 = 7 + tan2θ + cot2θ. If sec θ tan θ = m, show that m2-1m2+1=sinθ. In a trapezium ABCD, O is the point of intersection of AC and BD, AB ∥ CD and AB = 2 × CD. If area of AOB = 84 cm2, find the area of ΔCOD. Hence, area of ΔCOD is 21 cm2. In the given figure, AB ⊥ BC, GF ⊥ BC and DE ⊥ AC. Prove that ∆ADE ∼ ∆GCE. From (i) and (ii), we get AA similarity for ΔADE and ΔGCF. Or, the mean of the following distribution is 78. Find the value of P.
For calculating the mean, we prepare the table given below. Hence, the value of p is 13. Cumulative frequency just greater than 15 is 19. Corresponding class interval is 55 - 60. Thus, median class is 55 - 60. If two zeros of the polynomial p(x) = 2x4+7x3-19x2-14x+30 are 2 and -2, then find the other two zeroes. Since, 2and-2 are are two zeros of f(x), it follows that each one of x-2 and x+2 is a factor of f(x). Consequently, x-2x+2=x2-2 is a factor of f(x). Hence, the other two zeros are 32and -5. Prove that the area of an equilateral triangle described on one side of a square is equal to half the area of an equilateral triangle described on one of its diagonals. Or, prove that the ratio of the areas of two similar triangles is equal to the ratio of the squares of their corresponding sides. Therefore, its diagonal is 2a. Two equilateral triangles Δ ABE and Δ DBF are drawn. We know that all the angles of an equilateral triangle measure 60º and all its sides are equal. Therefore, all equilateral triangles are similar to each other. Hence, the ratio between the areas of these triangles will be equal to the square of the ratio between the sides of these triangles. Construction: Draw AL⊥BC and DM⊥EF. If sec θ + tan θ = m, prove that sin θ=(m2-1)(m2+1). 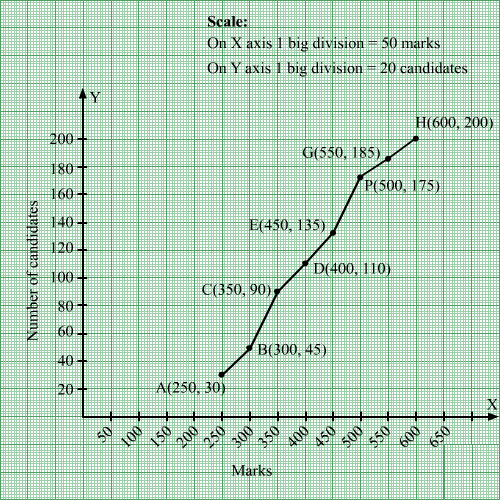 On a graph paper, draw a horizontal line X'OX and a vertical line YOY' as the x-axis and y-axis respectively. Putting x = 2, we get y = 5. Putting x = 3, we get y = 2. Putting x = 5, we get y = - 4. Now, plots the points A(2, 5) , B(3, 2) and C(5, - 4) on the graph paper. Join AB and BC to get the graph line AC. Extend it both ways. Thus, line AC is the graph of 3x + y = 11. Putting x = −3, we get y = −4. Putting x = 0, we get y = - 1. Now, plots the points P(-3, -4) and Q(0, −1). The point B(3, 2) has already been plotted. Join PQ and QB and extend it both ways. Thus, line PB is the graph of x − y = 1. The two graph lines intersect at B(3 , 2). ∴ x = 3 and y = 2 is the solution of the given system of equations. The region bounded by these lines and the y - axis has been shaded. 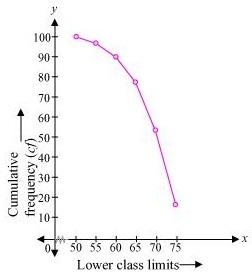 Draw a cumulative frequency curve using 'Less than' series. We plot the points A(250,30) , B(300, 45), C(350, 90), D(400, 110), E(450, 135), F(500, 175), G(550, 185) and H(600, 200) on a graph paper. Join, AB, BC, CD, DE, EF, FG and GH with a free hand to get the curve representing the 'Less than' series. 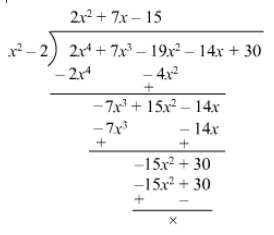 For what value of k will the following pair of linear equations have infinitely many solutions? ∆ABC is a right triangle. Thus, the triangle satisfies Pythagoras' theorem. Hence, the given triangle is a right-angled triangle. Find the mean and median of daily expenditure on food. Let the assumed mean A be 225; h = 50. Cumulative frequency just after 15 is 25. Corresponding class interval is 200 - 250. Median class is 200 - 250.